“What was that, my dear?” Elizabeth saw Mr. Darcy walking towards her. She smiled at him still amazed at how very lucky she was indeed. “I was just talking to myself, Fitzwilliam. Your wife has a habit of doing that. But it is too late to do anything about that now!” Elizabeth turned around and reached her arms out for Mr. Darcy. She loved hugging him though he was too unused to random hugs to relax completely. She would get him used to hugs though. “I would not change a thing. I love my wife just the way she is.” Mr. Darcy looked in his wife’s eyes and then lowered his head and kissed her. He was still in awe of his good fortune and if he did not have such good control over himself, he would have pinched himself several times today. Elizabeth ran her hands down Mr. Darcy’s chest. He was fully clothed in his wedding attire as was Elizabeth. Now that the wedding breakfast was over, it was time for them to begin their journey north, to the beautiful Darcy estate of Pemberley. It would be a journey of a few days. Georgiana and her companion Mrs. Annesley would be accompanying them in their carriage. Elizabeth thought they should start out with Georgiana with them as Mr. Darcy had not been with his sister for several months. Yet she felt guilty for being glad Georgiana was in her own carriage, for Elizabeth wanted Mr. Darcy to herself for a while. “You do not mind that we are leaving so quickly for Pemberley? I could delay our trip if you would like to stay here with your family for longer.” Elizabeth laughed and patted his chest. “Stay? Have you met my mother? No, I think it is much better for us to leave as quickly as possible.” Elizabeth was of course thinking not only of her mother, but of the Bingley sisters as well. Especially Miss Bingley. There was a new feeling she picked up from Miss Bingley since her engagement, and it was not a good one. She would much rather be far away from those two sisters. She knew Mr. Bingley was a good friend of Mr. Darcy’s, but hopefully when Jane and Mr. Bingley visited them at Pemberley, they would do so without Miss Bingley and the Hursts. Elizabeth never did figure out what Mr. Hurst did other than lie around and get drunk every day. She could not imagine having a husband like that. Elizabeth smiled. She agreed with him but it was not every day a girl got married. And for her, she planned that it would be done just once in her life. She was quite tired though. She had not slept a wink the night before. Elizabeth had finally given up and peaked in Jane’s room, to find her awake and sitting up as well. Both sisters talked of how excited they were yet nervous and their plans for the future. Elizabeth would miss Jane and her Papa the most. She hoped that with only two sisters left at home, Mr. Bennet would get out of his library and take a hand in raising the girls. It was not too late for Kitty, with Lydia gone her behavior could still be corrected. She did not have high hopes for Mary though. She was older and quite sent in her patronizing ways. Perhaps Mrs. Bennet and Mary would both need a place to live after Papa died. Elizabeth squeezed his hands. Mr. Darcy leaned in and kissed Elizabeth again, longer than the kiss before. He had better leave and start the proceedings to leave for Pemberley or if he was not mistaken, they would be spending their wedding night here at Netherfield. Not that he wanted to spend it on the road, but he certainly did not want to be at Netherfield. Mr. Bingley’s sisters would be too interested in how Mrs. Darcy was feeling the next day. Georgiana opened her door to reveal her cases sitting very neatly by the door. “I see that you are ready!” Georgiana was never ready for anything on time, so this surprised Mr. Darcy. Georgiana smiled and twisted her hands. She wanted to give her brother a hug, like she had seen Elizabeth do many times, but Mr. Darcy was not much of a hugger. She knew Elizabeth was working on changing that as she had told Georgiana as much. But thinking about hugging her brother and actually going through with it were two different things. Elizabeth closed her eyes. Of all the places for her mother to mispronounce, she had to do it in front of people that had actually been there. Elizabeth could not wait to leave. Even worse, Miss Bingley heard her mother’s mispronunciation and corrected her. That was another reason she would be so glad to leave. Elizabeth had thought that after her engagement announcement Miss Bingley would be scarce however just the opposite had occurred. Miss Bingley doubled her efforts at being around Mr. Darcy, talking to him and doing whatever she could to make it known that she was still there. She had been treating Elizabeth as if she were a ghost, completely invisible. It was enough to make Elizabeth want to run screaming while pulling out her hair. Elizabeth hugged him once more time and then let go. Get notified when the latest chapters of my books in progress are up! Elizabeth squeezed her husband’s hand again. It may be shocking to her husband, but she would not put anything past Lady Catherine de Bourgh. Elizabeth said nothing though as she did not know what to say to comfort Fitzwilliam that also would not give her away that his aunt in Bedlam did not bother her in the slightest. Elizabeth smiled and refrained herself from pinching her arm. This was all the most astonishing fairy tale. That Mr. Darcy still cared for her and married her despite now being the brother-in-law of the man he most disliked, George Wickham. Elizabeth could only imagine it would be a few days before she would receive a letter from Lydia asking for money. Even though Lydia was her sister, she did not feel any sympathy for her. Lydia had rebuffed all instruction and appeals for her to behave better. No, Lydia made the choice to run off with Wickham with her eyes open. Georgiana smiled and clapped her hands. “That is the best delight of all! I have flowers for all seasons. It is a garden of wondrous delights year round.” Georgiana then proceeded to list the names of the flowers and shrubs that would provide color throughout all the seasons, even winter with bright red berries. Elizabeth smiled at her new sister-in-law, so thankful that though she was of a younger age she was much more mature, than Lydia was. She could see a great friendship forming between herself and Georgiana in no time at all. As Georgiana talked about the latest song, she was learning on the pianoforte, she was interrupted by her brother. “Excuse me dear sister, I am very happy for your excitement to show Elizabeth Pemberley and your latest accomplishments, but I would like to have some time with her as well.” Mr. Darcy smiled at his sister who then blushed. Elizabeth reached over and squeezed Georgiana’s hand. “Do not worry, sister. I know you are very excited to have someone other than your brother now. And I am happy to have a new sister. Your brother is right though, I should probably spare some time for him. Do not you think?” Elizabeth ended with laughter as she turned her head to Mr. Darcy who was sitting next to her on the bench. It was quite late by the time they reached the Darcy townhouse in London. As with Pemberley, the townhouse was in a very desirous location. It was also appointed with rich rugs, furnishings and paintings though the interior was not gaudy and like his aunt’s Rosing’s Park. Elizabeth shook her head still not quite believing Lady Catherine had purposely poisoned her to get her out of the way. Thankfully Miss de Bourgh had not shown any signs of being upset that she had not married Darcy herself. Elizabeth certainly did not want to have to worry about another poisoning in the future. Though it was late, the servants lined up in the entryway greeting their master and the new mistress. The new Mrs. Darcy did not have any commands or changes for the townhouse at the moment. All she wanted was a light repast, a bath and then bed. Though she could forgo the bath if it was too much trouble as she knew how late it was. “Oh no, Mrs. Darcy. That is what we are here for. There will be a bath for you ready as soon as you are done with the repast Cook has prepared.” The housekeeper curtsied and began directing the maids and footmen. Elizabeth glanced at Darcy who smiled at her and raised his eyebrows. He then held his arm out directing her to enter the dining room first where footmen were bringing in what the housekeeper had called a light repast but to Elizabeth it looked more like a very nice meal. “I am astonished that your cook was able to have this ready and still at the perfect temperature when we arrived. How were they able to know the exact time we would arrive?” Elizabeth knew of the difficulties of planning meals so that everything was taken to the table at exactly the correct time. This was thanks to her mother’s discussions with the Longbourn cook. Elizabeth was never actually involved in those discussions though anyone in the house could not help but overhear the discussions. The footmen nodded and said that he would be sure to inform Cook. Mr. Darcy stood up and then paused looking at Elizabeth. Seeing his wide-eyed look and also knowing her own confusion at exactly what to do, Elizabeth burst out laughing. Which startled Georgiana awake with a jerk and a scream. Which caused Elizabeth to laugh even harder. Mr. Darcy started chuckling when several footmen, the housekeeper, Mr. Darcy’s valet and Cook burst in the dining room. Elizabeth glanced at Georgiana who had her hand over her mouth holding back laughter. Elizabeth closed her eyes and moved her hands further over her face trying to keep herself from laughing again. Elizabeth took that as a sign that they could now leave. She stood up, quickly averting her face from the servants so she would not bust out laughing at their expressions. She also avoided Mr. Darcy’s countenance as she was not sure whether he would be amused with her or not. He crooked his elbow which Elizabeth wrapped her arm around and Georgiana held onto Mr. Darcy’s other arm. Together they exited the room and walked up the wide staircase to the next floor. “I will bid you good night, brother and sister.” Elizabeth hugged Georgiana with a tight squeeze. Georgiana then went into her bedchamber which was the closest one to the staircase. Mr. Darcy continued walking with Elizabeth towards the far end of the hall where his bedchamber was. Elizabeth tried to calm her breathing and nerves. She had never listened to gossip or stories, so she was not quite sure of what happened during the wedding night. She had seen animals about the countryside, so she knew somewhat of what was to be expected. Mr. Darcy stopped before reaching the end of the hallway. “This is the bedchamber of the mistress of the house. I know that you are tired and have had a long day so I will leave you here.” Darcy gave her a quick kiss on the cheek and went into his bedchamber leaving Elizabeth standing in the hall. Elizabeth did not know whether to feel relief or disappointment, but she did feel rejected. The maid curtsied and opened the door to Elizabeth’s bedchamber. Elizabeth walked in, still not sure how she felt about being alone on her wedding night. Can't wait to read the rest? Buy it now on Amazon. Elizabeth could barely keep her eyes open when the maid came into the bedchamber. It had taken forever for her to fall asleep last night. Even though she had been tired from the long day and the restless nights leading up to her wedding day, she knew exactly why she did not sleep well. That was due to the man sleeping in the room next to hers, her husband. He was her husband in name only because the marriage had not been consummated the previous night. Even just thinking about it caused Elizabeth to blush. Maybe he was having a lie in and she could go back to sleep. Though she could not imagine why he would. He had probably slept soundly and had gotten up with the dawn. He seemed like the type of man to not lie about in bed. Shopping? Elizabeth groaned again. She felt like all the Gardiner nieces and nephews had been jumping on her all night. She was sore from traveling, and she was tired from being awake all night worried about her wedding night. She wished Mr. Darcy had taken kindness upon her and just gotten it over with so that she could sleep. She would never be able to sleep well until it was over. And that was an of the other reason why she could not sleep why did he not claim his husbandly rights last night? She was not the only one that had been exhausted from the day. From what she had seen of the animals in the countryside, the act itself only took a few minutes. It not seem strenuous at all. If his not claiming his rights did not have to do with him being tired, then why? Elizabeth groaned. She did not want to disappoint her new sister-in-law, but she also did not care to visit shops. Especially with this headache that was brewing behind her eyes. It was her fault for letting her fears get the best of her. She might as well just get up and face the day. Elizabeth contained her groan and drank the rest of her tea. She was not looking forward to it, but if Mr. Darcy felt that she needed better clothes, she would not defy him. She knew herself that her clothing was not up to the standards of a higher society, the kind of people that would call upon the newly married Darcy couple. She sighed and dragged herself out of her bed. Mr. Darcy had been attentive all day to Elizabeth. He had been concerned as Elizabeth avoided his eyes with a blush. This was the opposite of her usual behavior, which is what he had expected. He was sure that he had been very magnanimous in leaving Elizabeth alone last night to let her rest and sleep after the day’s travel. However, she had been unusually quiet all day. Georgiana made up for Elizabeth’s unusual silence by talking. That Georgiana was not shy around him, was not new to Mr. Darcy, but that his sister had warmed up to Elizabeth so quickly was. Georgiana talked in the carriage with little comment needed from Elizabeth or Mr. Darcy. Elizabeth turned to him, her wide eyes evidence of her surprise. “I am well, thank you.” She did not expound upon that observation, which was also unusual. Elizabeth blushed and looked down at her hands. “I assure you, I am quite well. I am tired though as you smartly ascertained.” She finally met his eyes with a quick smile but turned away to look out the carriage window. Again, Mr. Darcy was uneasy with the fact that his new bride was avoiding his eyes. He continued to stare at her as the carriage moved through the crowded and noisy London traffic. If only his mother was still alive, or he had a close older female relative that Elizabeth could to talk to. Or even for him to talk to as he did not have experience that other men of his age with fortunes did. Darcy was shy and therefore had little knowledge of women. What had happened to their easy comradeliness they shared before they got married? Oh, no. Mr. Darcy was sure he had figured out the cause of the uneasiness with Elizabeth. It had something to do with the bedchambers last night. He had been very gallant in allowing his wife to sleep in her own bedchamber in the townhouse which was new to her, instead of being required to perform her wifely duties after a day’s travel. He had planned to allow her time to get settled in at Pemberley before he claimed his rights. Mr. Darcy did not know exactly what was wrong, but he was certain he at least knew when the problem began. The coach slowed and stopped as they were at their next destination. Mr. Darcy needed to get Elizabeth alone to bring up his thoughts, but that would prove difficult with Georgiana along. Mr. Darcy sighed. He would have to approach Elizabeth after they got back to the townhouse. He was impatient to fix whatever problem existed. He did not want any issues to grow between them. 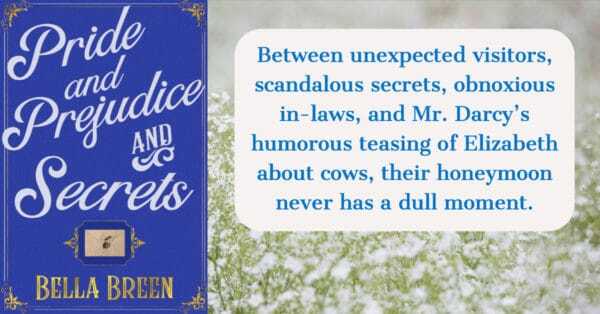 You've been reading Pride and Prejudice and Secrets. 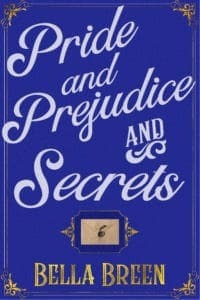 Pride and Prejudice and Secrets is a 58,000 word novel, Book 2 in The Poison Series but it can be read as a stand alone.